Some of us may have seen in print media or on the internet stories and myths about the women in Rizal's life, which are for the most part dealing with trivia. After stumbling into this article by Ms. Linda Acupanda McGloin, who wrote with great insight about the women in Rizal's two famous novels: Noli Me Tangere and El Filibusterismo, I feel the need to reread them (last time 30+ years ago) and further appreciate the genius of Jose Rizal, one of our greater national heroes. The below article on McGloin's interpretations are profoundly relevant for us native Filipinos in understanding ourselves: our class-conscious culture and society, our customs and values, way of thinking and behaving, our so-called damaged culture, all of which are in large part products of our colonial history, of cultural imperialism that dominates us native Filipinos and the homeland, then and now. By Linda Acupanda McGloin, FFP Bulletin (Spring/Summer 1992). The problem of colonization may be compared to a cancer of the body and the soul--a foreign body forces its way into a healthy, living mass, digs its heels into its structural systems, flows through its nerve centers, and creates a colonial mindset. José Rizal spoke of such a cancer in his novel Noli Me Tangere, one of the earliest literary attempts to reveal the colonial mindset phenomenon. Colonization not only shaped the political and economic landscape of the Philippines, it also influenced cultural expressions and mental processes. Whatever serious historical and collaborative researchers would declare as a more reliable account of a people, the question of history bears directly on the problem of identity, which brings us to the difficulty of definition. What is a Filipina? Is she Asian or Western? Is she the reluctant leader Corazon Aquino, or is she the self-proclaimed "symbol of beauty for her people" Imelda Marcos? Is she the modern-day Gabriela Silang who envisions and works towards cross-sectoral changes, or is she one of the millions of faceless and nameless struggling multitude who does anything just to put rice on the table, the ordinary Juana de la Cruz? The notion of identity for Philippine women reflects the problem of national identity for men and women alike. Unlike those of many of its Asian neighbors, the Philippine national psyche has been pounded by the fists of several masters. Each of these experiences has left their scars as each foreign power brought with it the trappings of sexual oppression and subjugation of their own systems. This is not to say that the pre-colonial Philippines was free of sexual exploitation, but when those values were grafted onto the colonial social, economic, and political institutions forged over centuries of foreign rule, the task of defining one's identity as a Filipina became even more complicated. Given the importance of literature in expressing social and historical events, the following question is posed within the context of national identity: Can literature contribute to the formation of identity, or the perpetuation of conflicting self-images? Literature has played an important role in the history of people. The Philippines presents interesting glimpses of early culture expressed by way of legends, myths, maxims, and proverbs. In spite of the censorship of social ballads and poetry during the Spanish and American colonial periods, other forms, such as song, dance and drama, flourished along with other literary expressions. The Philippine mythical version of creation (the tale of a bamboo split open by the constant pecking of a bird disclosing the first man and woman who rose together from the hollow of the split bamboo) reveals two seemingly concurrent concepts which might have contributed to the notion of the "Filipina mystique." Second, the succeeding colonial period carried the colonial thinking which attempted to replace this mythical notion of equality with the reality of a feudal hierarchy. Despite the attempt to eclipse the pre-colonial notion of gender equality, Philippine history is replete with examples of women who adhere to the notion of equality but, at the same time, accept the reality of hierarchy. The implication of an early paradigm of gender character and equality may have, to some extent, begun the process of identity formation. On the surface, the Philippine myth does not seem to introduce the notion of conflict. What is projected is compatibility and harmony. Just when and how, then, did the problems of identity conflict for the Philippine woman come about? The language of the colonizer is found to not only serve as a vehicle for literary expression, but also for setting forth the idealized image of a Filipina from a male perspective. A brief glance at literature shows an evolution of sorts of the Filipina from the pre-colonial Maganda of indigenous folklore, to the early 1800s Laura who epitomizes beauty and faithful acceptance of her role as prescribed by culture, religion, and society; and to the fictional characterization of womanhood drawn from two works of historical fiction by José Rizal, Noli Me Tangere and El Filibusterismo. Although Rizal's central protagonists in both novels are men, the significance of the women characters lies in their symbolic portrayals of a people of many images, of a country torn apart by race, culture, and class. In Rizal's attempt to define a nation's identity by addressing the need for national reforms and by exposing the evils of colonialism, he may have also encouraged the need to demystify the Filipina. The colonial Spanish period's desired image of a Filipina is embodied in the character of María Clara--beautiful, demure, modest, patient, devoutly religious, cultured, submissive, and virginal. The blood that runs through her veins is more European than native. Her ancestry is noted since it has a bearing on the idealized model of a Filipina, the Roman Catholic's Virgin Mary, European and foreign. María Clara belongs to the elite; her kindness is not to be equated, however, with social awareness. She is a repressed woman and her weakness and despair over a lost love overwhelm her, enabling powerful and sinister forces to slowly drive her to death. Perhaps, to a certain degree, this "ideal" is still upheld today, contributing to the confusion of identity formation, for the original application of the character "Filipino" was only for Spaniards and their descendants who lived on the islands; the indigenous natives were simply called "indios." The 19th century saw a character reversal process: the latter ("indios") who have capitulated, are now called "Filipinos" while the former, mostly direct descendants of colonizers, now prefer to call themselves "Spanish." The character Doña Victorina is a reflection of the triumph of colonialism--the alteration of behavior and thinking patterned after the character's perception of a superior race. One hundred years ago, there was a Doña Victorina. Today, the trappings of a colonial mindset persist, and is expressed in the attraction to look Western and to consume Western goods. Doña Victorina is a characterization of lost identity. Her frivolity, and that of Paulita Gómez, who is greatly enamored by the trappings of the elite, who loves the man who could maintain the needs of her class, and who is a vain and flighty version of María Clara, may be seen today in the persona of Imelda Marcos. The likes of Imelda Marcos also mirrors, ironically, another Rizal character, Doña Consolación, who can be described as an interesting specimen of colonial deformation. She may serve as an example of "the dehumanization of the indio," a case of total alienation from her original self, or from her potential self. The character Sisa also represents the opposite image of Paulita, a contradiction of the so-called high status and the liberated label describing the Filipino women today. She is the woman Mary Hollensteiner speaks of in her article, "The Wife": quietly suffering from subjugation, sacrificing to put food on the table, living only for her sons. Sisa represents the silent victims of an oppression which drove her to madness and death. There are millions of Sisas in the Philippines today: the unfortunate women who are scavenging for food in the mountains of trash, the degraded women whose bodies are used as commodities, and the abused wives who are repeatedly beaten by their husbands. The other woman, Julí, emerges as the one character who chooses death over a life in shame. She suffers abuse and humiliation working as a servant to pay her family's debt. She brings to mind the women of today who work for starvation wages. Julí refuses to be coerced, her death liberates her from oppression. Among these characters, perhaps Julí best characterizes a sense of purpose and identity. In Rizal's characters, the women who seem to be able to obtain their desired needs no matter the consequences are Doña Victorina, Paulita Gómez, and Doña Consolación. On the other hand, misfortune seems to be the fate of the women whose consciousness could be raised to levels higher than that of self-sacrifice. The all-giving attitude of María Clara, Sisa, and Julí leads them to their deaths. Within their social strata, each character is confronted with varying degrees of oppression which in turn defines the parameters of liberation. In their ambition to hold on to the symbols of the ruling class, the former group has made themselves seemingly strong and highly visible handmaidens of a system which feeds on varying levels of coercion and subjugation. The latter group's retreat into death or madness carries two concurrent views: 1) the strength to exercise a final liberation as a form of defiance to oppression, and 2) the weakness and inability to confront any form of injustice. Who is more oppressed? Who has really liberated herself? Perhaps, what we are seeing is the notion that oppression has slowed down the process towards a national identity in general and towards a Filipina identity in particular. The reality is that the Philippines is a country still going through the throes of colonization. Why is the resolution of identity important? Delia Aguilar gives a sobering view in her article, "On the Women's Movement Today": "I think that one of the most serious injuries inflicted upon us by our colonial masters has been on our very psyches, in the way we look at the world and the way we look at ourselves." Indeed, there are those who have catapulted to the highest ranks, such as Corazon Aquino and Imelda Marcos, who embody differences in substance, style, and character. However, there are contradictions. Corazon Aquino's high visibility, status, and power contradicts the image of a meek and subservient wife loyal to the memory of her husband; while Imelda Marcos, the "Iron Butterfly" of unparalleled extravagance, is a drastic contrast to the image of a once dutiful and subservient wife. Despite the fact that both overcame the traditional roles assigned to women of their social class by reaching positions of political power, they remain subservient to the memories of their husbands, but exemplify the interests of the class they represent. Class interest is perhaps the overriding difference between highly visible women, such as Corazon Aquino and Imelda Marcos, and the fervent activist women carrying the legacy of an intellectualized Gabriela Silang. While women in power and women working for empowerment both assert a heritage and demand a platform, the contradiction probably lies in the former's subservience and the latter's ability to address issues that cut across class lines. But class again diametrically separates political women from those who suffer in silence, such as the patient and self-sacrificing women who toil to feed their families, work in sweat shops, as vendors, scavengers, and prostitutes. There are also those who come faceless and nameless for they may flit and slide and go seemingly where the wind blows. All these, indeed, a kaleidoscope of conflicting Filipina identities. Not only do Rizal's novels provide a matrix for identity and conflict, they also allow a rare view of a people's past which formed their culture today, and of a social cancer of which, up to the present, "the best cure" is still to be found. In the process of identity formation or perpetuation of identity conflict, the women in Rizal's novels best serve as bridges in the development process, allowing the flow from the early 1800s mythical formation to the current emerging identity. The social, cultural and political context of both past and present are mirrored in the novels. The myth of the "high status" of the Filipina has caused Philippine women, wittingly or unwittingly, to become at times participants in their own oppression. This "containment by elevation" has allowed the essence of womanhood to be subjected to and dictated by rules and regulations formulated by and for the satisfaction of a colonial society. Philippine women find themselves attempting to wade out of a quagmire of confusion over their identity. With each attempt at clarification comes the difficulty of discernment, giving rise to the question: Will the real Filipina please come forward? Rosalinda A. McGloin is originally from Dumaguette, Negros Oriental, Philippines, where she received her undergraduate degree from St. Paul's College. She received her Master's degree in liberal studies from Duke University in 1990 with a concentration in Third World Literature. She is currently working as the statewide coordinator for Multi-Cultural Organizations for the North Carolina Arts Council of the Department of Cultural Resources. She lives in Durham, NC with her husband and two sons. In a way, the Knights of Rizal and others of their curious thinking and social predilection are compelled to stand by their idol for fear that the popularity of Bonifacio and Mabini and, consequently, of their teaching, might bring about a transvaluation of values which may well be the first move that will lead to the displacement of those who compose the privileged class. Is the courage displayed by Rizal at bagumbayan on December 30, 1896 the supreme quality that should entitle him to be the national hero? Should his uncanny ability to master languages be counted in his favor? Or should his numerous love affairs, as recorded in the pages of a nonnook by one who had prifited from the Rizal centenary, constitute a point to be posted in the credit column of his ledger? In a word, he had the wisdom to realize that any action, particularly revolutionary action, participated in and led by the dispossessed like Bonifacio would be a leveling process that may bring up the propertyless to the level of the propertied but will surely bring down the men of property to the level of the poor. But one indication that Rizal might not retain his premier position in the national pantheon for long is that the young Filipinos who are fast coming to the fore are beginning to be disturbed by the thought that the consuming ambition of the man whopse birth and death they are celebrating annually was to remain a subject of Spain. (12-28-1968). Today,three days before the anniversary of the execution of Jose Rizal, the votaries of the increasingly large cult of the national hero will smoother him with praise as if he were a Rotarian or an overgrown Jaycee, and the doddering members of that strange and curious organization known as "Knights of Rizal" will try, yet once more, to transform his fraities into canonical virtues. 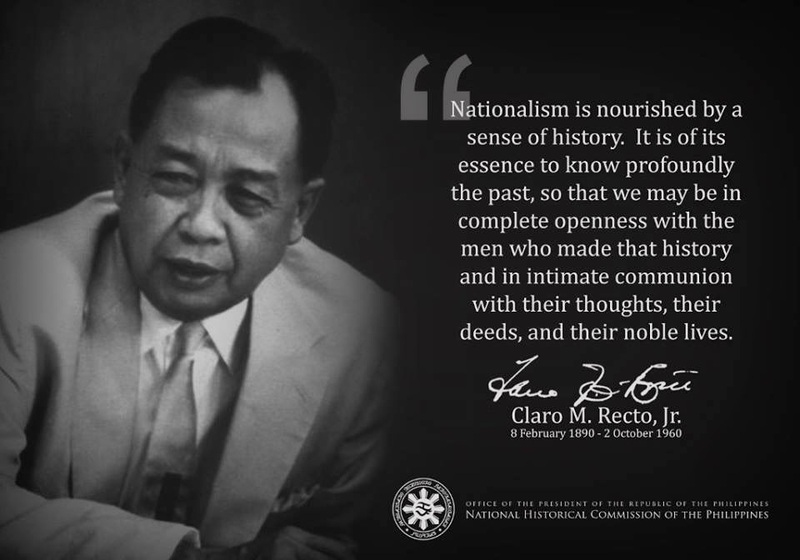 But the completely middle-class background of Rizal and the passion he had for security and stability made him useless, made him a hindrance, as a matter of fact, to the fulfillment of the task of shifting from mere prpaganda to political action. This is why the pertinent question to ask is whether Rizal, with his devotion to the job of preserving the status quo, with slight modifications to give the status of his class some dignity, can be of service and inspirationto the armies of young men and young women who have learned to express their protests in terms of rallies and demonstrations. Rizal would make a perfect hero for a society which has been isolated from stress and want. But in the Philippines today is not that society. The young Filipinos who will soon hold the floor have become venturesome, and, what is of utmost importance, they havev made themselves receptive to the example of their fellows elsewhere. To them, therefore, Rizal has nothing to say. (12-27-1968). This movement of making Rizal more than he was will continue. For the Rizalists are a determined lot. And since the vast majority of them are equipped neither with the patience nor the insight of true scholars, what they will ultimately accomplish is frightening even to contemplate. Already they have made an esoteric cult of the hero. There are published works on his love affairs. There are pamphlets on his travels and evn brochures on the hotels he stayed in. There are long essays puporting to interpret his adolescent poems in terms he never imagined. Above all, there is a constant strwam of articles on his most trivial thoughts. This is all very regrettable, for granting his limitations, Rizal left some very sound ideas whcih can serve us today. These ideas, which form the core of his essays and novels, have a validity all their own. And strange as it may seem to the Rizalists, these ideas can stand by themselves, without being propped up by the hardly relevant fact that Rizal was a compulsive lover or by the fact that he spoke, according to an oppressively ignorant Rizalist, eighteen languages. This is the danger that the so-called Rizalists pose. For if they succeed completely in their organized effort to surround Rizal with their cultist cloud, the image of the national hero will degenerate to the level of quaint personality. Thus the Rizalist will acomplish with their adoration for the hero what Rizal's enemies have failed to accomplish with their fear and hatred of his thoughts and ideas. (6-19-1962).